A terrific way to celebrate Christmas while in Paris is a special trip to Disneyland Paris. OK, let’s get this out of the way from the get-go. In no way would I recommend a first-time tourist to the City of Light to take an entire day out of a typically jam-packed schedule to visit the Disney theme park. Simply put, there is more than enough to do—and more than enough holiday-themed sights to see and events in which to participate—in Paris itself. But, I also know that there are Disney fanatics out there (and I count myself among you!) that place a high priority on visiting Disneyland parks, particularly those outside the U.S. so as to see a “new” perspective on all things Disney. And there are many Americans who make a beeline to Disneyland and/or Disney World each holiday season simply to see the parks decorated from top to bottom for the holidays. And Disneyland Paris is a veritable winter wonderland this time of year. What’s so special about the park during the Christmas season? For starters, there are the aforementioned decorations. While not as over-the-top as the Christmas decor at the U.S. parks, Disneyland Paris’s holiday decorations are still quite charming. And while the entire park sports wreaths, garlands, ornaments and more, the park’s entrance and Main Street district leading up to Cinderella’s castle are particularly festive. 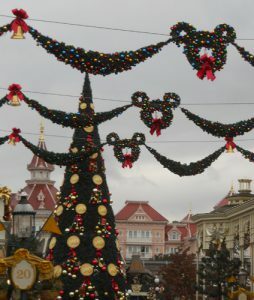 There also are numerous special events held at the park, including expanded access to Disney characters (particularly Elsa and Anna from “Frozen”), a daily tree-lighting ceremony on Main Street, a daily Christmas-themed parade through the park, special photo opportunities with Disney characters (including with Jack Skellington on an amazing recreation of a “Nightmare Before Christmas” set), a special “snowfall” on Main Street each evening, and nightly fireworks. 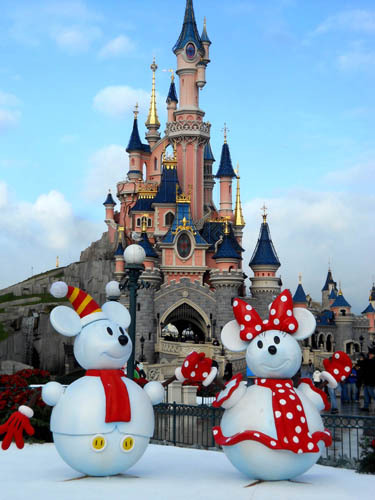 Disneyland Paris’s Christmas events and decorations are on tap through January 7. The park is very easy to reach from Paris (it’s located in the suburb of Marne-la-Vallee). Simply hop on the Metro to Charles de Gaulle Etoile, Auber, Chatelet Les Halles, Gare de Lyon or Nation. At any of these stations, you’ll need to switch to the RER regional trains (and buy a separate ticket for it, since Paris Metro passes/tickets don’t cover suburban trains). Board the RER A train to Marne-la-Vallee — the signs for this train also are conveniently marked Parcs Disneyland. The last stop is just outside Disneyland in what is essentially the Paris version of Downtown Disney. One-day tickets to Disneyland Paris are 65 euros for adults, 59 euros for children. The park is open Monday-Friday 10 a.m.-7 p.m., Saturday 9 a.m.-10 p.m. and Sunday 10 a.m.-10 p.m. From Dec. 20 through Dec. 30, extended daily hours are from 9:30 a.m. to 10 p.m. And on New Year’s Eve, Disneyland Paris is open from 9:30 a.m. to 1 a.m. 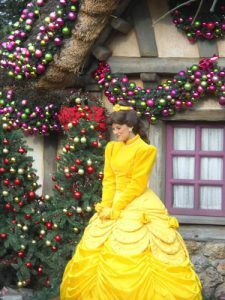 This entry was posted in Christmas, Entertainment and tagged Disneyland Paris by Bob Adams. Bookmark the permalink.